Lace cookies get their name from the fact that the cookies look like lace: delicate, thin and with a lot of holes. Lace cookies were one of the first types of cookie that I baked with regularity. Regular oatmeal cookies and chocolate chip cookies were very high on the list, too, but lace cookies appealed to me because the ingredient list was very short and the cookies were quite tasty. I think the first recipe I ever used only included oatmeal, butter, sugar and an egg. I’ve since branched out from that basic recipe and now include more flavorings in my lace cookies to make them more interesting. I also now bake them just for the pleasure of eating them, rather than because I’m completely out of the ingredients I need to bake anything else. The cookies are still very simple to make and don’t require any prep other than heating up the oven. There is no flour in these cookies, so they’re wheat free. If you know that your oatmeal is gluten free (not all brands are, just because of processing contaminants, but there are several out there), they’re a good choice for a GF cookie. Rolled millet flakes might be a good substitution if looking for other GF ideas for these cookies, but I think that oatmeal is going to give you the best overall flavor. Use quick-cooking rolled oats, or pulse regular rolled oats in the food processor a few times to break them up into smaller bits. You’ll get the best “lace” finish with smaller oats. The cookies are very light and very buttery tasting. 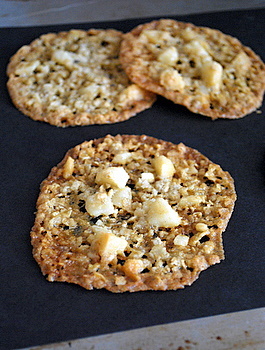 Toffee/caramel notes – a result of the sugar cooking with the cookies’ butter in the oven – match well with the oatmeal, and the macadamia nuts give a little bit of extra substance to the cookies. I like to finely chop them so they blend in better with the overall lace pattern, but you can make them as large or small as you like. The cookies are very crisp when they have just cooled from the oven, and must be stored in a dry, airtight container to preserve their crispness. I always layer the cookies with sheets of wax or parchment paper when I’m storing them to keep the from sticking together. Be sure to bake the cookies until they are golden brown, otherwise you’ll lose the crispness in favor of a very chewy, almost too delicate to handle, cookie. These cookies are very versatile. Drizzle them with a bit of melted chocolate to dress them up, or use them to garnish a bowl of ice cream. Or, of course, just eat them plain with a cup of coffee. Preheat oven to 350F. Line a baking sheet with parchment paper or a nonstick silpat. In a large bowl, cream together butter and sugar until smooth. Beat in egg, salt, baking soda and vanilla extract, followed by oatmeal and macadamia nuts. 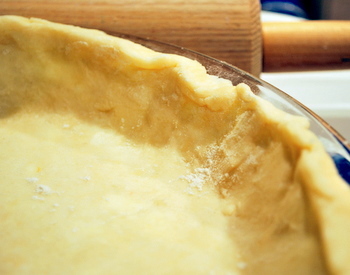 Let batter sit at room temperature for about 10 minutes. Drop rounded teaspoonfuls onto prepared baking sheet, leaving about 3 inches between each cookie to allow for spread. Bake for 8-10 minutes, or until cookies are golden. Cool on baking sheet for 5-10 minutes before transferring cookies to a wire cooling rack. Cool baking sheet completely before using for another batch of cookies. Those look and sound great! I love new and different type of cookies!! These a beautiful! I have wanted to make lace cookies. Do you think using steel cut oats would be a good to use? Cookienurse– steel-cut oats would not work for this. They take at least half an hour to cook, so they’d never cook during baking. Some Great looking cookies , however chocolate are my favourite. Just an FYI – Barley is NOT gluten free! Wheat, barley, and rye are the grains to avoid on a gluten-free diet. Ella – Thanks, I amended the suggestion! Would these be okay if made as minis and as cupcake toppers? I think your cookies are gorgeous! My guessis I would have to lower teh overn temp…but I am not sure.